Greek accounts.—Mythology local in origin.—Antiquity.—Conquests.—Colonies.—Three great gods.—Twelve great gods.—Angels.—Spirits.—Anu.—Anatu.—Vul.—Ishtar.—Equivalent to Venus.—Hea.—Oannes.—Merodach.—Bel or Jupiter.—Zirat-banit, Succoth Benoth.—Elu.—Sin the moon god.—Ninip.—Shamas.—Nergal.—Anunit.—Table of gods. IN their accounts of the Creation and of the early history of the human race the Babylonian divinities figure very prominently, but it is difficult in many cases to identify the deities mentioned by the Greek authors, because the phonetic reading of the names of the Babylonian gods is very obscure, and the classical writers often mention these divinities by the terms in their own mythology, which appeared to them to correspond with the Babylonian names. In this chapter it is only proposed to give a general account of some parts of the Babylonian mythology, to show the relationship between the deities and their titles and work. Babylonian mythology was local in origin; each of the gods had a particular city which was the seat of his worship, and it is probable that the idea of weaving the gods into a system, in which each should have his part to play, only had its origin at a later time. 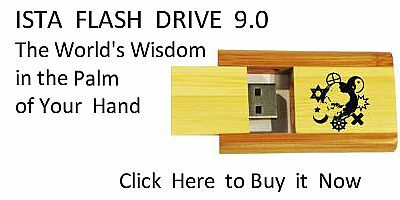 The antiquity of this mythology may be seen by the fact, that two thousand years before the Christian era it was already completed, and its deities definitely connected into a system which remained with little change down to the close of the kingdom. the "great gods" of the country. Subsequent changes led to the decline of these cities, but their deities still retained their position at the head of the Babylonian system. 1. Anu, king of angels and spirits, lord of the city of Erech. 2. Bel, lord of the world, father of the gods, creator, lord of the city of Nipur. 3. Hea, maker of fate, lord of the deep, god of wisdom and knowledge, lord of the city of Eridu. 4. Sin, lord of crowns, maker of brightness, lord of the city of Ur. 5. Merodach, just prince of the gods, lord of birth, lord of the city of Babylon. 6. Vul, the strong god, lord of canals and atmosphere, lord of the city of Muru. 7. Shamas, judge of heaven and earth, director of all, lord of the cities of Larsa and Sippara. 8. Ninip, warrior of the warriors of the gods, destroyer of wicked, lord of the city of Nipur. 9. Nergal, giant king of war, lord of the city of Cutha. 10. Nusku, holder of the golden sceptre, the lofty god. 11. Belat, wife of Bel, mother of the great gods, lady of the city of Nipur. 12. Ishtar, eldest of heaven and earth, raising the face of warriors. Below these deities there was a large body of gods forming the bulk of the pantheon, and below these were arranged the Igege, or angels of heaven, and the Anunnaki, or angels of earth. Below these again came various classes of spirits or genii called Sedu, Vadukku, Ekimu, Gallu, and others; some of these were evil, some good. The relationship of the various principal gods and their names, titles, and offices will be seen by the following remarks. followed by the two forms sar and kisar (the Kissare and Assorus of the Greeks), sar means the upper hosts or expanse, kisar the lower hosts or expanse; these are also forms of manifestations of Anu and his wife. Aim is also lord of the old city, and he bears the names Alalu and Papsukul. His titles generally indicate height, antiquity, purity, divinity, and he may be taken as the general type of divinity. Anu was originally worshipped at the city of Erech, which was called the city of Anu and Anatu, and the great temple there was called the "house of Anu," or the "house of heaven." Anatu, the wife or consort of Anu, is generally only a female form of Anu, but is sometimes contrasted with him; thus, when Anu represents height and heaven, Anatu represents depth and earth; she is also lady of darkness, the mother of the god Hea, the mother producing heaven and earth, the female fish-god, and she is one of the many goddesses called Istar or Venus. in high esteem in Syria and Arabia, where he bore the name of Daddi; in Armenia he was called Teiseba. Vul is always considered an active deity, and was extensively worshipped. Another important god, a son of Anu, was the god of fire; his name may be read Bil-kan, with the possibility of some connection with the Biblical Tubal Cain and the classical Vulcan. The fire-god takes an active part in the numerous mythological tablets and legends, and he is considered to be the most potent deity in relation to witchcraft and spells generally. The most important of the daughters of Anu was named Istar; she was in some respects the equivalent of the classical Venus. Her worship was at first subordinate to that of Anu, and as she was goddess of love, while Anu was god of heaven, it is probable that the first intention in the mythology was only to represent love as heaven-born; but in time a more sensual view prevailed, and the worship of Istar became one of the darkest features in Babylonian mythology. As the worship of this goddess increased in favour, it gradually superseded that of Anu, until in time his temple, the house of heaven, came to be regarded as the temple of Venus. The planet Venus, as the evening star, was identified with the Ishtar of Erech, while the morning star was Anunit, goddess of Akkad. the moon-god, who is sometimes confounded with the daughter of Anu. A companion deity with Anu is Hea, who is god of the sea and of Hades, in fact of all the lower regions. He has two features, and corresponds in some respects to the Saturn or Cronos of the ancients, in others to their Poseidon or Neptune. Hea is called god of the lower region, he is lord of the sea or abyss; he is lord of generation and of all human beings, he bears the titles lord of wisdom, of mines and treasures; he is lord of gifts, of music, of fishermen and sailors, and of Hades or hell. It has been supposed that the serpent was one of his emblems, and that he was the Oannes of Berosus; these things do not, however, appear in the inscriptions. The wife of Hea was Dav-kina, the Davke of Damascius, who is the goddess of the lower regions, the consort of the deep; and their principal son was Maruduk or Merodach, the Bel of later times. to the rise of Babylon. The wife of Merodach was Zirat-banit, the Succoth Benoth of the Bible. Nebo, the god of knowledge and literature, who was worshipped at the neighbouring city of Borsippa, was a favourite deity in later times, as was also his consort Tasmit. Beside Merodach Hea had a numerous progeny, his sons being principally river gods. A third great god was united with Anu and Hea, his names were Enu, Elu, Kaptu, and Bel; he was the original Bel of the Babylonian mythology, and was lord of the surface of the earth and the affairs of men. Elu was lord of the city of Nipur, and had a consort named Belat or Beltis. Elu, or Bel, is the most active of the gods in the general affairs of mankind, and was so generally worshipped in early times that he came to be regarded as the national divinity, and his temple at the city of Nipur was regarded as the type of all temples. The extensive worship of Bel, and the high honour in which he was held, seem to point to a time when his city, Nipur, was the metropolis of the country. Belat, or Beltis, the wife of Bel, is a famous deity celebrated in all ages, but as the title Belat was only "lady," or "goddess," it was a common one for many goddesses, and the notices of Beltis probably refer to several different personages. The same remark may be applied to the name Istar, or Ishtar, meaning "goddess," which is applied to any female divinity. 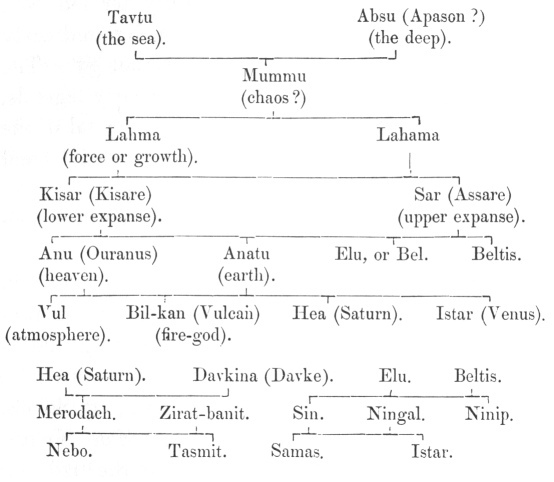 Elu had, like the other gods, a numerous family; his eldest son was the moon-god called Ur, Agu or Aku, Sin and Itu, in later times generally termed Sin. Sin was presiding deity of the city of Ur, and early assumed an important place in the mythology. The moon-god figures prominently in some early legends, and during the time the city of Ur was capital of the country his worship became very extensive and popular in the whole of the country. Ninip, god of hunting and war, was another celebrated son of Elu; he was worshipped with his father at Nipur. Ninip was also much worshipped in Assyria as well as Babylonia, his character as presiding genius of war and the chase making him a favourite deity with the warlike kings of Assur. Sin the moon-god had a son Shamas, or Samas, the sun-god, and a daughter, Istar or Venus. Shamas is an active deity in some of the Izdubar legends and fables, but he is generally subordinate to Sin. In the Babylonian system the moon takes precedence of the sun, and the Shamas of Larsa was probably considered a different deity to Shamas of Sippara. Among the other deities of the Babylonians may be counted Nergal, god of Cutha, who, like Ninip, presided over hunting and war, and Anunit, the deity of one city of Sippara, and of the city of Akkad.